When an accidental handgun/firearm discharge is claimed by a Virginia criminal defendant, that is an affirmative defense that may be presented by the defense against an unlawful firearm discharge prosecution. 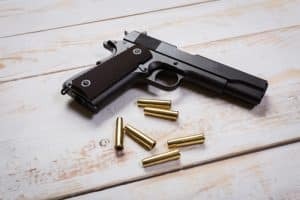 The Virginia Supreme Court recently confirmed that the prosecution/Commonwealth has no burden to prove that the indoor firearm discharge was not accidental. Bryant v. Commonwealth of Virginia, ___ Va. ___ (April 5, 2018) (affirming the Virginia Court of Appeals decision, which I blogged about last year). Fairfax criminal lawyer underlines the necessity of weapons safety. Even though I believe in a Second Amendment with teeth — both because defanging any part of the Constitution can defang the rest and because we need a counterbalance to the existing harsh handgun laws — I of course urge safety with all weapons. I do not deny that it can feel freaky to walk or drive down the road in Virginia knowing that so many people might be armed, and can even openly carry handguns in holsters. As much as the National Rifle Association (NRA) — which is only two miles from my office — is receiving more criticism than ever, firearm users are wise to consider NRA and local gun shops as one of their resources for assuring safety in firearm possession and use. Fairfax criminal lawyer Jonathan L. Katz has successfully defended scores of people charged with weapons offenses and thousands of people charged with crimes in general, since 1991. Jon will be delighted to discuss your case by a confidential appointment set through his staff at 703-383-1100.